I met a blogger at an Instameet recently and we discussed a few blogging basics that day. While on my way back from that technical meeting, I stopped at Cafe Coffee Day - Civil Lines, Jaipur, which is very near to my house. I thought it would be a good Idea to have a chilled glass of my favorite Tropical Iceberg Coffee. So I ordered one for me, along with a Chicken Sandwich. To sit, I chose the window seat right next to the billing counter. While I was waiting for my order to arrive, I noticed some reflections in the big wall to wall glass window adjacent to my seat. I thought maybe, there was a Minimalist Shot in those reflections. After composing a few frames roughly through my eyes, I decided to stop trying as the clutter was way too much. The famous tagline of Cafe Coffee Day goes "A lot can happen over Coffee". Well, it played out quite well for me. After, about 4-5 gulps of Tropical Iceberg Coffee, I noticed this Distant Brown Chair, through the glass window next to me. 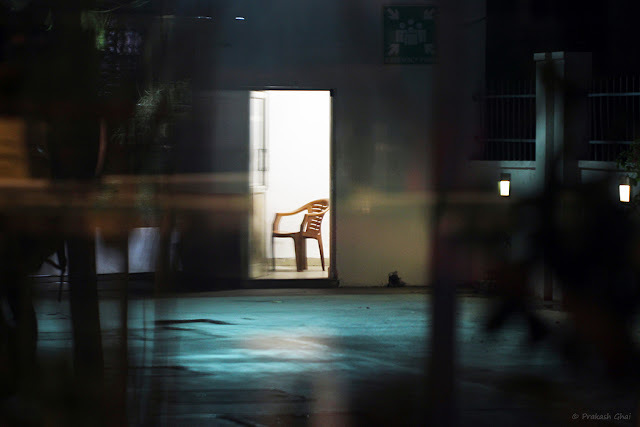 The Chair was placed inside the small room of the Security guard of the building. Although it was night and the light wasn't much, thankfully the security guard's room had this bright white illuminating light falling on the Distant Brown Chair. This presented me with a great opportunity to capture a decent Minimalist Photograph. Well, in the end I was satisfied with the composition and now I can safely say that at least for me "A lot did happen over Coffee". b) The Rule of thirds* is not applied here. The brown chair is placed almost in the center. *I always mention that one should never place subjects in the center of the frame. But here, I did place the subject in the center and the reason is: the Vertical White Rectangular box, within which the Distant Brown Chair is placed, makes the chair appear Off-Center visually. I hope you understand what I mean with "appear off-center visually, despite being in the center. Also, both ends of the frame, i.e left and right are dark and blurred, that further justifying the lack of rule of third requirement rule. With that "Off-center and Rule of Thirds MESS", its a wrap for the day !